Translation of article in the science appendix of the North-Holland daily news, by journalist Roel van Leeuwen, published 2017-09-01. Read original Dutch article here. Petten – The packages of Curium in Petten find their way by road and by air (via Brussels and often not via Schiphol) to hospitals worldwide almost every day. With the radioactive content of the packages, many thousands of lives are improved or saved annually. A fresh wind blows at Curium, as evidenced by the fact that Director Frank de Lange of Curium in Petten accepted the invitation to talk about developments within the company. When the company was a subsidiary of the US listed company Mallinckrodt Pharmaceuticals, publicity was usually shunned. Curium specializes in the production, processing, registration and distribution of medical isotopes, which reveal all kinds of abnormalities in the hospital or which are used for treating patients. 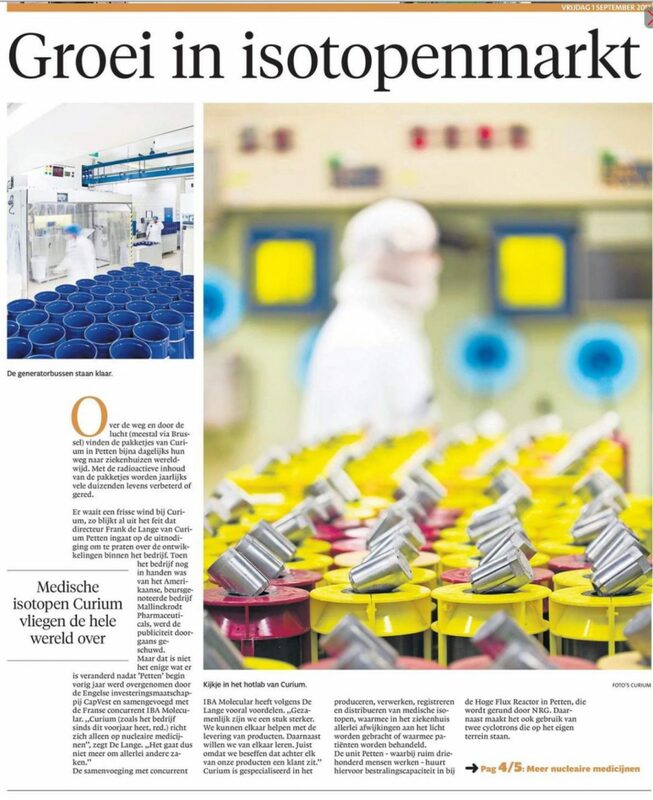 The Petten unit – employing over 300 people – hires radiation capacity at the High Flux Reactor in Petten, run by NRG. In addition, it also uses two own cyclotrons. Daily at five to six shipping times, shipments with medical isotopes leave the premises. A large part of which is transported to countries in Europe. For destinations further away, the airport in Brussels is used. “We don’t use Schiphol airport very often because KLM has chosen not to transport radioactive materials. Conversations with KLM to change this have not been successful so far. “But it would be nice if the drive was shorter,” said De Lange. Curium in Petten buys radiation capacity in research reactors. Especially at the HFR (two thirds), but also in reactors in Belgium and Poland. But Curium itself also owns various facilities in Petten. For example, Curium has a molybdenum plant, which is leased from neighbor NRG. Herein the material irradiated in the nuclear reactor is processed in five different cells, until a purified molybdenum solution remains. The pure molybdenum is contained in a small stainless steel vial. “With the content 30,000 to 50,000 patients can be diagnosed”, says director Frank de Lange. This molybdenum is the basis for the technetium generators that go to the hospitals. In Petten, also other medical isotopes are produced, some of which by means of the two on-site cyclotrons. Furthermore, Curium supplies non-radioactive products called cold kits. These are substances that are linked to the medical isotope in the hospital and attach to a specific organ, tissue or cell type. In this way, the radioactive substance goes directly to the right place in the human body.